No Photos Of Us, originally uploaded by Lukasmummy. Credits: Layered template (From My Playlist, 31st December 2010) by Molly Weight (Biograffiti) and 52 Inspirations 2011 Week Four Mini by Vicki Stegall and 52 Inspirations 2011 The Basics by Sue Cummings and Vicki Stegall. 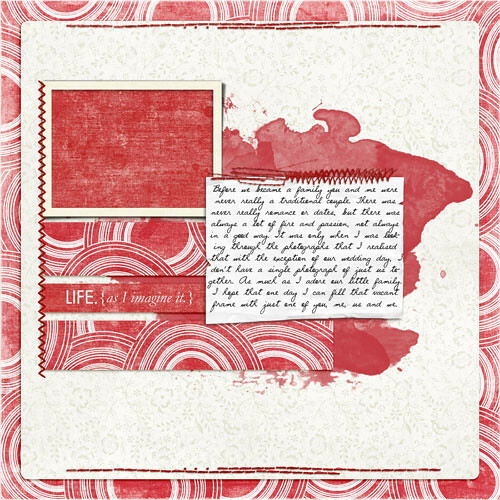 Font is DJB Joy Script by Darcy Baldwin. Journalling reads: Before we became a family you and me were never really a traditional couple. There was never really romance or dates, but there was always a lot of fire and passion, not always in a good way. It was only when I was looking through the photographs that I realised that with the exception of our wedding day, I don’t have a single photograph of just us together. As much as I adore our little family. I hope that one day I can fill that vacant frame with just one of you, me, us and we. Enabling: From My Playlist Template 31st December 2010 by Biograffiti is available here, 52 Inspirations is a subscription based product by Vicki Stegall and Sue Cummings available exclusively at Oscraps here but if you want to pick up just the Week Five Mini and 52 Inspirations 2011 The Basics you can do that here and here. Posted on February 7, 2011, in CT Layouts and tagged 52 Inspirations 2011, Darcy Baldwin, Oscraps, Sue Cummings, Vicki Stegall. Bookmark the permalink. Leave a comment.